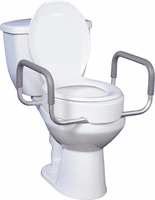 Raised Toilet Seats and Risers, Elongated Raised Toilet Seats,Lock On Raised Toilet Seats and Toilet Riser Kits. Scroll down to see our selection of Raised Toilet Seats and Risers for sale. Raised toilet seats and risers are assistive technology devices to improve the accessibility of toilets to older people or those with disabilities. Typically made of a heavy duty composite plastic and in some casing having a padded seat, raised toilet seat risers can help aid in transfers. Patients with hip replacements have a hard time bending at the waist and the use of a raised toilet seat or riser takes the strain off of sitting and standing. Most falls in the elderly happen in the bathroom and the use of a raised toilet seat or riser may help prevent those unwanted falls..